ErgoExpo 2016 - What a Week! ErgoExpo 2016 – What a Week! Home » ErgoExpo 2016 – What a Week! On 15th November 2016 we headed to the wonderful ErgoExpo in Las Vegas for three days of talks, showcases, demos and networking. The result: a bone fide success! 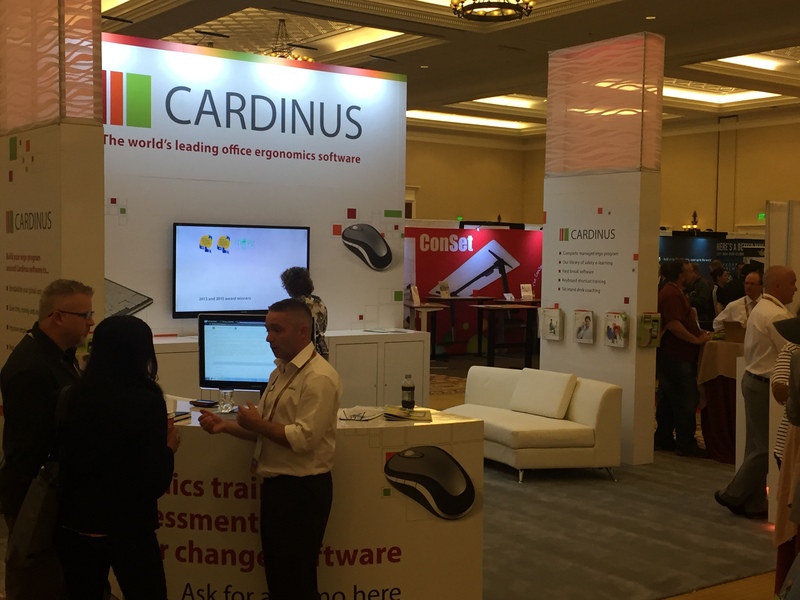 Manning the Cardinus stand, where we demoed our latest office ergonomics software Healthy Working, were Jon Abbott, Ryan Pavey and our US president Bill Pace. For those not in the know, ErgoExpo is the world’s largest ergonomics conference with delegates coming from across the globe to see the latest advancements, the best software and the most effective products. From our point of view, it’s a fantastic opportunity to meet with friends and connections from our twenty years in the ergonomics business. And our set up was a cosy one too, replete with sofas to make for a relaxed atmosphere. One of Bill Pace’s highlights was Woody Dwyer’s keynote talk on the opening night. 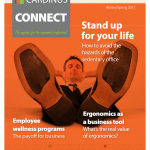 Entitled ‘Ergonomics and Workers’ Comp Challenges in a Changing Workplace’ it was packed with beneficial insights for the US market. The talk covered changing technology and the multi-generational workforce, in particular, how this combination is creating a myriad of new challenges for the ergonomics and health and safety profession. And his other highlight; attending Cirque du Soleil’s Absinthe with Woody, another excellent reason why staging ErgoExpo in Las Vegas makes for an incredible location for networking and making friends. Below, Jon Abbott networks in front of our bespoke stand. We look forward to next year too! There’ll be a new venue and it’s going to sit right in the summer months. We’re thrilled about the new venue and hope to see you there!